(Newser) – Los Angeles' 96 million shade balls are bizarre to say the least—which is partly why the media pounced on the story of their role in conserving water, as officials had hoped, Grist included. Now, the website does a careful walk-through of just why these balls aren't so hot. Based on an LA Weekly report, Grist finds the city has been using the balls since 2008, before California's drought, because their main purpose is to prevent the formation of bromate, a carcinogen that develops when sunlight mixes with bromide and chlorine in water. Why do we care about the balls now? Apparently, LA mayor Eric Garcetti correctly thought tying the balls to the drought would help sell them to the public and emphasized they'll save 300 million gallons of water a year. 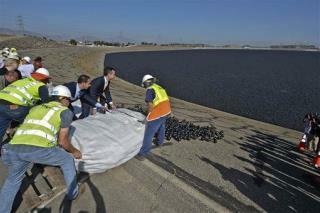 However, that much water is worth $2 million or $20 million over a decade; LA's shade balls cost $34.5 million, according to LA Weekly. Jesus, just give every one in the Fckng state STILL SUITS..... Maybe then the spice will flow again! We already see the pols are as stupid as the people who live there. How can farmers cut 5% more water when most were allocated zero surface water for the second year already, and the rest were cut by 80%? 50% of all CA's water flows to sea for result-less fish-saving experiments and no accountability while everyone else is mandated to count every drop. The true allocation is 50%-environment, 40%-food producers, 10%-urban. If you ignore the 50% enviro use, then double what's left, you get the 80% and 20% uses. Clever and twisted misinformation.